Dermatophytes are fungi that can infect human skin, hair and nails, and can cause different types of tinea. These diseases can be treated effectively with antifungal agents. In rare circumstances, they can invade deep into the dermis by direct extension from ruptured infected hair follicles, or by direct invasion and traumatic implantation of fungi from an infected epidermis. Majocchi’s granuloma and dermatophytic pseudomycetoma fall under the former type of dermal invasion. Those without discernable follicular origin or with extensive dermal infiltration by fungal elements are collectively termed “deep dermatophytosis”. They are also known by other names, such as tinea profunda, invasive dermatophytosis, disseminated dermatophytosis or dermatophyte abscess. When skin is the only site of infection, the disease is categorized as deep dermatophytosis; when skin and lymph nodes and/or other organs are involved, the infection is considered invasive dermatophytosis. This article will review the clinical presentations, pathologic characteristics, underlying disease and treatment outcome of patients with deep dermatophytosis reported in published studies. Based on a search done primarily on PubMed, there were 79 reported cases of deep dermatophytosis between 1975 and 2016. The age of the patients ranged from 8 to 83 years old (39.8 ± 16.6). 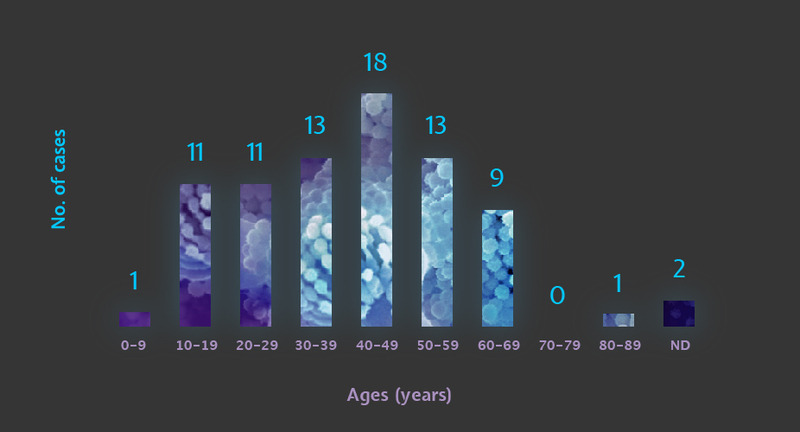 Teens to patients in their sixties were most commonly affected (Figure 1). The male to female ratio was 2.43:1. According to published studies, the clinical presentation of deep dermatophytosis was variable, including solid red nodules, plaques, papuloplaques, large ulcers, cystic nodules and masses. Some patients had associated lymphadenopathy. Upon examination of the skin biopsy, fungal elements were seen in the dermis, which could be enhanced by periodic acid-Schiff (PAS) or Gomori methenamine silver (GMS) stains. The number of fungal elements in the tissue was small, but cases with massive fungal hyphae in tissue have been reported. Angio-invasion has also been reported, indicating evidence of hematogenous dissemination of dermatophytes. Immunodeficiency, such as plasma factor deficiency, decreased T-cell activity, and Caspase recruitment domain-containing protein 9 (CARD9) gene mutation. 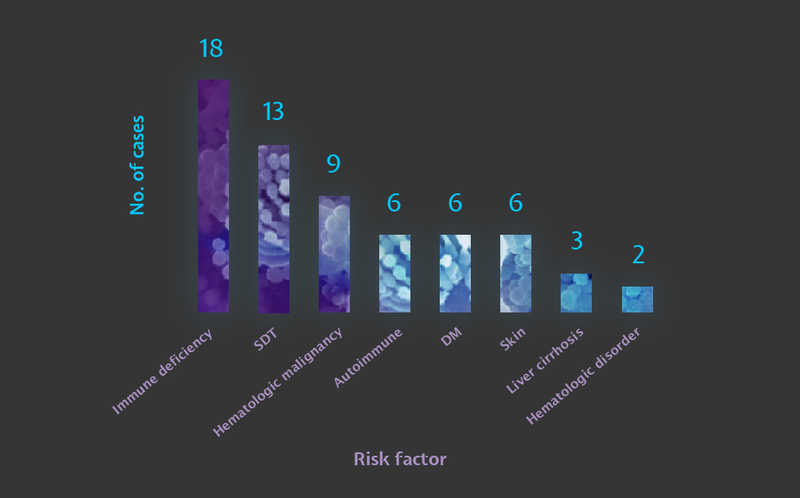 Based on the published cases, immune deficiency was the most common risk factor (Figure 2). In 18 patients with immune dysfunction, 12 had an underlying CARD9 deficiency. CARD9 is an important protein in the immune signaling pathway against fungal pathogens; its roles in invasive fungal infection have been extensively investigated. The second most important risk factor is solid organ transplantation. In 13 patients receiving organ transplantation, 8 had renal transplantation (62%), 2 had heart transplantation, 1 had liver transplantation, 1 had kidney and liver transplantation, and 1 had heart and lung transplantation. The causative fungi were isolated and identified in 73 cases, and included almost all common pathogenic dermatophytes. Trichophyton rubrum was the most common (n=40), followed by T. violaceum (n=10) and Microsporum canis (n=8). Two cases had combined infections of T. rubrum and T. violaceum and two others had combined infections of T. rubrum and T. verrucosum. Other pathogens were T. mentagrophytes, T. tonsurans, T. schoenleinii, M. audouinii and Epidermophyton floccosum. The pathogenesis of deep dermatophytosis is still not fully understood. Based on the published cases of deep dermatophytosis, most had a superficial dermatophytosis on the body (eg, tinea corporis, tinea pedis, onychomycosis), which served as a source of infection. There are two ways of dermal invasion by dermatophytes. One is by passive introduction of dermatophytes into the dermis through a ruptured infected hair follicle or scratching trauma from the overlying superficial tinea. The other is direct invasion from epidermis down to the dermis. The invading dermatophyte can usually be detected and eradicated by host immune cells, but when patients have impaired immunity, either congenital or iatrogenic, pathogens can proliferate freely and infection in deep tissues ensues. Currently, there are no treatment guidelines available for deep dermatophytosis. But considering the depth of invasion, systemic antifungal agents should always be used. The most commonly used drugs were fluconazole, itraconazole and griseofulvin, followed by terbinafine and amphotericin B. Ketoconazole, voriconazole and posaconazole were used in a few cases. Of the published cases, 75% received antifungal monotherapy, and others were treated with two or more different antifungal drugs. Ten cases had their lesions removed with surgery. For 47 patients with deep dermatophytosis limited to the skin (no organ involvement), all survived or died from causes unrelated to dermatophytes. In the 32 cases with invasive deep dermatophytosis and internal organ and/or lymph node involvement, the prognosis was quite different: 7 patients had complete remission of their disease; and 11 patients had partially resolved lesions or were stable after treatment. The disease recurred in two patients, and nine died of invasive dermatophytosis. The mortality rate was as high as 28%. Three cases were lost to follow-up or the outcome was undocumented. In conclusion, deep dermatophytosis is a rare and invasive form of dermatophyte infection, which may lead to mortality. An accurate diagnosis relies on the combination of skin biopsy for histopathology examination and fungal culture to identify the pathogen. The host immune status plays a major role in disease pathogenesis, extent and prognosis. Systemic antifungal treatment is always necessary. Superficial tinea should be properly managed before starting immunosuppressive treatment, because it may become a source of invasive fungal infection. In patients who require the extensive application of immunosuppressive therapy, clinicians should be on high alert for these potential threats from the skin surface.